Off the success of The Hundreds STREET MEET, we announce EAT MEET, a celebration of The Hundreds lifestyle through social gathering and delicious food. 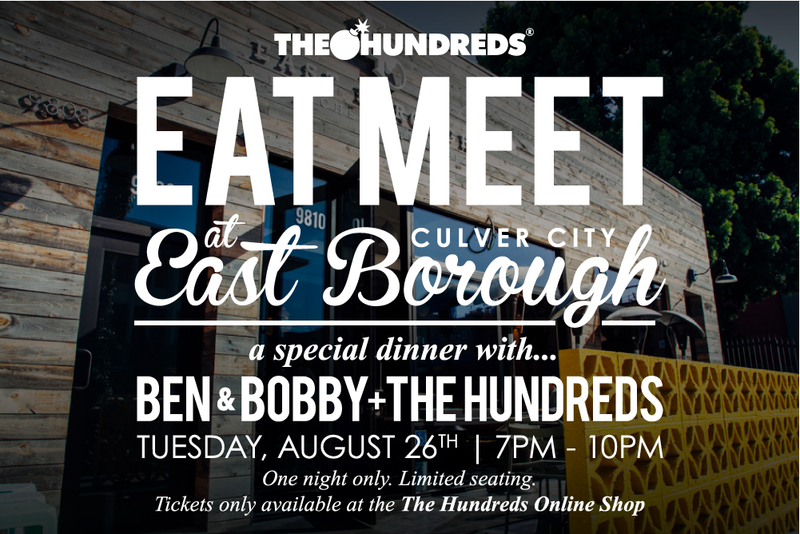 EAT MEET is a private dinner for our community in Los Angeles – an opportunity to break bread with Ben, Bobby, and the rest of the The Hundreds family at one of our favorite restaurants in the city. Our inaugural EAT MEET will be hosted by our friends at East Borough Culver City on Tuesday, August 26th, starting promptly at 7pm to 10pm. Admission is $50 and includes a 5-course set menu (with new items that guests will be the first to try), a collaborative The Hundreds X East Borough T-shirt, and an intimate night to share conversation and New Vietnamese dishes with the founders and team behind The Hundreds. Drinks are not included. Tickets are limited to 50 and go on sale right now in The Hundreds Online Shop. 4 tickets per person/per transaction. Tickets are non-transferrable. Tickets purchased as a gift must be noted in the checkout process.